Loose, saggy skin is a major concern for many men and women. While there are dozens of skin tightening procedures available, none stand out more than Ultherapy. Ultherapy is a safe and non-surgical ultrasound treatment that reverses the effects of gravity on the skin. This popular skin tightening procedure has the power to lift, tighten, and firm skin for enhanced youthfulness. Learn more about Ultherapy and why it has become one of the most sought-after skin tightening treatments in the world. Ultherapy offers incredible skin tightening results that are truly unique. The procedure is currently the only treatment with an FDA indication for a non-invasive lift. Ultherapy is the only non-invasive procedure that has been FDA-cleared to improve fine lines and wrinkles on the face and the décolletage. This procedure is often preferred by patients who are not yet ready to undergo surgery. As a non-invasive procedure, Ultherapy allows you to treat your moderate skin laxity without the pain, complications, or downtime associated with surgery. Ultherapy uses precise ultrasound technology to bypass the surface of the skin and treats deeper skin layers that can’t be achieved by other non-invasive procedures. The treatment stimulates collagen production within the skin, resulting in a significant tissue lift over a two to three month period. 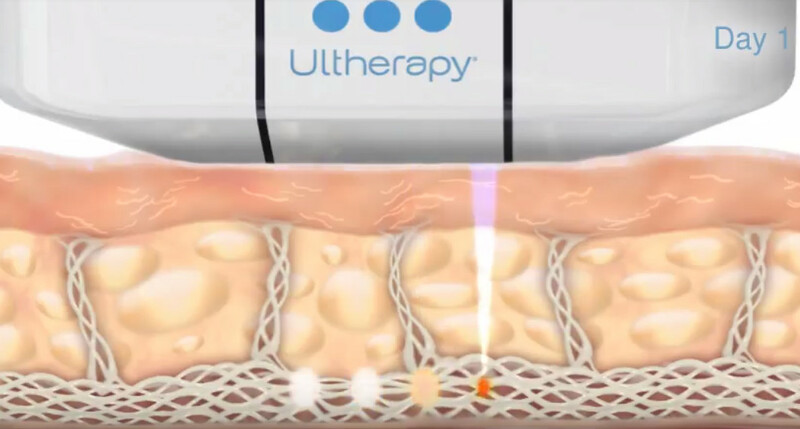 One of the biggest difference of Ultherapy versus others is that the depth of the sound wave penetration makes it possible to target the tissue layers that could be previously addressed only by surgery. Other procedures can only target the upper layers and not able to reach that deep. This is why some skin tightening treatments are typically used to treat superficial skin and is not FDA-approved to “non-invasively lift” the skin like Ultherapy. When undergoing skin tightening treatment, most people want to know how long it will take to see results. What makes Ultherapy so unique is that the results of one treatment are long-term. As the procedure stimulates the natural production of collagen in the skin, it takes at least three months to see visible results. How long will the results last is actually dependent on the person’s own body, genetics and age. The natural aging process can also affect the results over time, but maintenance procedures can also be done. Most patients only need one treatment of Ultherapy to achieve optimal results. The body’s biological response to the ultrasound treatment stimulates the collagen-building process for the skin to look and feel firmer and more beautiful. As skin will continue to age, touch up treatments can help you keep up with your aging skin. Ultherapy can also be combined with other non-invasive treatments, such as BTL Exilis, a radiofrequency treatment that further enhances your skin tightening results. You may be a good candidate for Ultherapy if you have mild to moderate skin laxity or if your skin is starting to feel saggy. It may either be loose skin on your neck, a lowered eyebrow line, or fine lines or wrinkles on your chest. Schedule your consultation now with our Harvard-trained skin specialist, Dr. Sylvia Ramirez, at Cutis aesthetic clinics in Singapore and takes years off your skin.